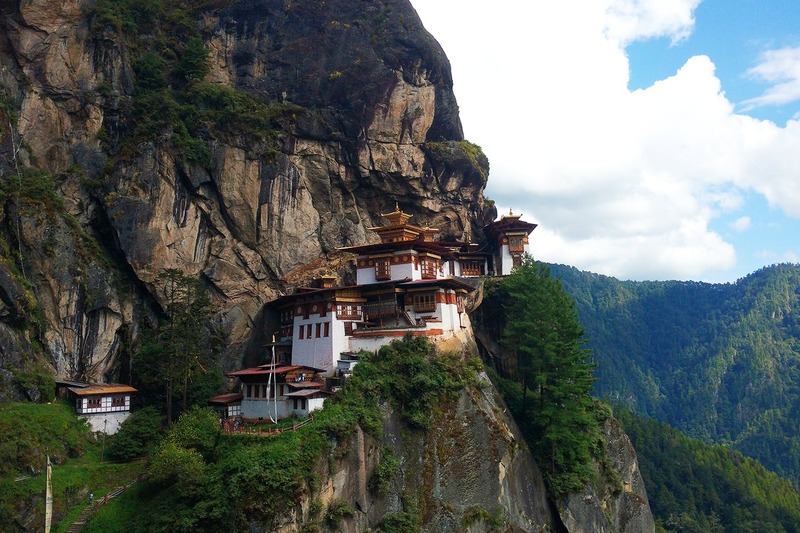 Bhutan is called the last Shangri-La on earth and it totally lives up to that title. Here’s how to make a trip to this heaven in 20k or under. Board a train from Kolkata to New Alipurduar (closest to the Phuentsholing gate). Fares come around for an average of INR 1,050. Take a cab from New Alipurduar Station to Phuentsholing gate (about INR 500). You will need to get a permit/visa to enter Bhutan which you can do on-the-spot at the Phuentsholing gate by presenting your Aadhar card or passport. Be warned that it’s quite time consuming and the office closes by 4pm and is shut on weekends. Or you can opt for an online permit by providing your passport scans and your itinerary. Get it sorted here. Pocket pinch: 1,000 Nu (INR 1,000). Once your passport gets the stamp at the Phuentsholing Permit Office, it’s “Kuzu, zangpo la, Bhutan!” Or “Hello, nice to meet you, Bhutan”. Do pick up a temporary tourist sim card (for INR 300) and a keep a copy of your ID. Bhutanese accept Indian currency so you need not worry about converting. Take a taxi to Paro, it’s a blissful six hour journey from Phuentsholing and will cost you around INR 2,700. Stay: Almost all resorts in Paro come with incredible views and graceful hospitality. You can check in at Dharma Resort (INR 3,000). Airbnb has several great options, like the gorgeous Ama’s Village Lodge (INR 1,300), a 15-minute drive from Paro. Head out to Paro Dzong / Rinpung Dzong to marvel at Bhutanese architecture and the huge walls adorning thangka paintings, that depict life of Buddha and other deities. You can also visit Thangka painting studios in Paro, some of these are on sale, but expensive (and rightly so because it’s made on pure silk and takes them months to prepare). Eat At: Paro has a number of cafes and eateries where momos, thukpa and instant Koka noodles can be found every 20meters. You must have some ema datshi, a creamy soupy preparation made with cheese and chilli with red/brown fried rice. Check out Champaca Cafe and Authentic Pizza. Total cost would be around INR 1,000. Rise early and head to Dochu La Pass to enjoy the grand views of the Everest. Also check out Chimi Lakhang, the fertility temple with phallic art and installations and the Punakha Dzong, also known as Pungtang Dewa chhenbi Phodrang (meaning ‘the palace of great happiness’. It was built in 1637–38 and is the second oldest and second largest dzong in Bhutan. Entry fee is INR 400 and you get a monastery tour with a guide. The dzong houses the sacred relics of the southern Drukpa Lineage of the Kagyu school of Tibetan Buddhism. And finally, do visit the the suspension bridge. Your taxi cost will be about INR 3,000. Eat At: I loved the eclairs at the Druk Wangyel Cafeteria, Phuenzhi Diner (ask them for Bumthang-style pancakes), or Chimi Lakhang Cafeteria. It will cost about INR 1.500. Trek to Taktsang Monastery or The Tiger’s Nest. Take a cab to the base camp, entry is INR 500. It’s roughly a 2.6 miles trek uphill. Eat At: The Taktsang Cafeteria, which falls on the route to the monastery (about INR 350). #LBBTip: Make sure you carry a tiny lock, as all your stuff, including your phones and cameras, gets deposited at the security check before you enter the monastery. Visit the capital, and check out the Buddha Dordenma, located atop a hill in Kuenselphodrang Nature Park overlooking the Thimphu valley. The statue is said to emanate an aura of peace and happiness to the entire world. At a height of 51.5 m, it is one of the largest statues of Buddha in the world. It’s made of bronze and is gilded in gold, and get this – 125,000 smaller Buddha statues have been placed within the Buddha Dordenma statue, 100,000 statues of which are 8-inches-tall and 25,000 statues of which are 12 inches tall. You can see the entire city from there. The cab to this place will cost about INR 900. Shop: Since it is your last day, stock up on souvenirs for everyone back home. All local markets are stuffed with colorful souvenirs. You should definitely pick up a few bottles of Zumzin, a peach wine made in Bhutan for your friends, and pure yak wool stoles that come for just INR 800. And some local textiles. Eat At: Select between Continental and Italian if you’re slightly bored of rice and thukpa at Central Cafe, Thimpu.